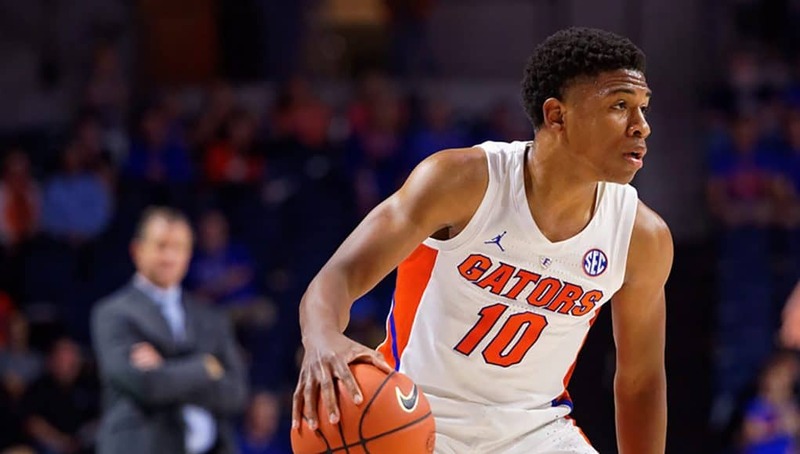 Florida’s freshmen class has been a special one only 18 games into the season with Andrew Nembhard starting since night one while Noah Locke and Keyontae Johnson commanded starting roles with their consistent play, something you wouldn’t normally associate with first-year players. This group of 2018 recruits have already set a Florida record by being the first three freshmen to start a game for the Gators since at least 2000 (I couldn’t find data for the years prior) but there are some major individual records being chased as well. 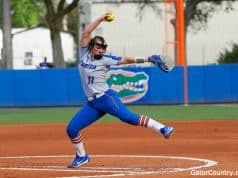 Here are some potential accomplishments to keep an eye on for the remainder of this season and beyond as you watch these talented freshmen compete. There will be a few times in this article I will refer to a projected season total for a particular stat. For these projections I’ve decided to use a 34 game season for the Gators, though obviously in reality they could be a few games shorter or longer depending on how things go in post-season play. After looking at the past few seasons I think 34 games is a good, conservative number that is fair for these projections but keep in mind they could be a little bit different. This record for threes made by a freshman is currently held by Anthony Roberson in 2002-03 with 74. Noah Locke, currently with 50 made threes, is easily on his way to taking this record. Right now he’s averaging 2.8 threes made per game and if he continues that he’ll end at 95 (based on the 34 game projection), crushing the previous record. The 2.8 threes per game he’s currently at is his average for the season which takes into account the first handful of games where he didn’t play a major role in the rotation. If you look at his last 9 games where he has gotten upwards of 21 minutes he’s been averaging 3.8 threes per game and if he keeps that pace up he’ll land around 110 made threes which would put him into an even better class. If he were to hit 110 threes he would end up 4th on the list of threes made in a season, tying Kenny Boynton. 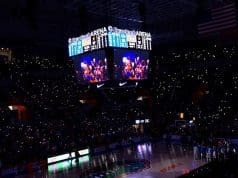 Florida’s record for threes made in season? 118, held by Michael Frazier II. Noah Locke is very much in the mix for this record. It would be difficult because as I mentioned before even if he keeps up the hot shooting of the last 9 games he might still land a bit short but also remember that I used a 34 game projection and the Gators could find themselves playing one or two more than that. The fact that Locke, as a freshman, is in the running for most threes made in a season also means he has a chance at another feat. Currently held by Kenny Boynton with 333 this is a record that I think will belong to Noah Locke if he ends up staying for four years at Florida. As I mentioned earlier his conservative projection for threes made this season will be 95. If he were to do that for four years that would be 380 threes, usurping Boynton as the 3-point king. And that would be if he didn’t get any better as a shooter. Also, for interest’s sake, the NCAA record for career 3-pointers made is held by Oakland’s Travis Bader with 504. It might be tough for Locke to catch him but he might be ahead of the pace as Bader made 94 threes as a freshman. If Locke continues to drill threes at a consistent pace throughout his career this NCAA record could even come into play. With 6.1 assists per game this season Andrew Nembhard has been a wizard distributing the basketball. Currently with 109 assists on the year, 6.1 dimes per game puts him on pace for 206. Unfortunately for Nembhard the current record for assists by a freshman belongs to Nick Calathes with 221. That doesn’t put Nembhard far off the pace and he could very well catch him with a few more big assist games like he had against Texas A&M with 11 or if the Gators can win a few postseason games to get the chance to play more (Calathes played 36 games that season, and Nembhard’s 36 game assist projection would be 218). This is going to be a tight race that will come down to the wire. I think we all know who holds this record, it’s Chris Chiozza with 571, a record he obviously set last season. Only averaging 4.1 assists per game for his career due to playing with another point guard in Kasey Hill for his first three seasons, Chiozza’s record definitely isn’t untouchable. It should also be noted that last year as a senior he had 208 assists, a number Nembhard might eclipse this season as a freshman. If Nembhard were to stay at Florida at four seasons, he would absolutely crush this record. Dismantle it. Grind it to powder. He’d probably finish with around 900 assists, maybe even more, and possibly get into the top-10 of career assist leaders in the NCAA (the record is held by Bobby Hurley with 1076, by the way). But here’s the thing, he’s not staying for four years. Nembhard could decide to go pro after this year, or maybe stay one more and then go to the professional ranks. I will note, just because it is interesting, that if he stayed for three seasons he would almost certainly have this record and have it easily. If he played out his junior year he’d likely end with around 660 assists, a few long and easy strides past Chiozza for the lead. Will that happen? I personally don’t think he’ll stick around for long enough but if he does, know he’ll be the assist king. I just thought I’d note this record too even though it isn’t as flashy as some of the more all-time totals records. Nick Calathes unsurprisingly holds this record at 6.28 assists per game and as you may have noted from earlier, Andrew Nembhard isn’t far behind at 6.1 per game. 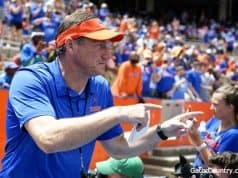 This is a record Nembhard could nab even if he’s only in Gainesville for one season but it’s also one I think he’ll get if he stays longer. This is a special group of freshmen and we could be witnessing the start of some all-time great career by Gators. Whether it’s the freshman records or the all-time ones the fact that Noah Locke and Andrew Nembhard are in the mix shows just how amazing their seasons have been and just how good of players they are. The number of post season games they get to play may make a difference. Calathes never made ncaa tourney so deep runs could help the freshmen with stats.